Touch Design Page type is more than just a fun page to use in your app - it’s a powerful and useful tool for creating real sports strategies and tactics or for having a drawing board in your app. With this simple yet incredibly versatile page type, you can create, save and share complex sports tactics or kids drawings. 1. 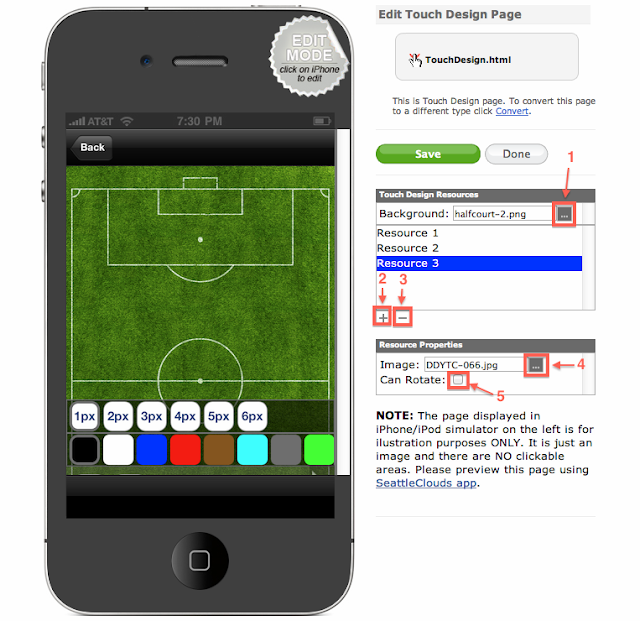 In order to add a new Touch Design page to your app access its Dashboard. Go to Edit Pages menu then click the "+" (Add New Page) button. 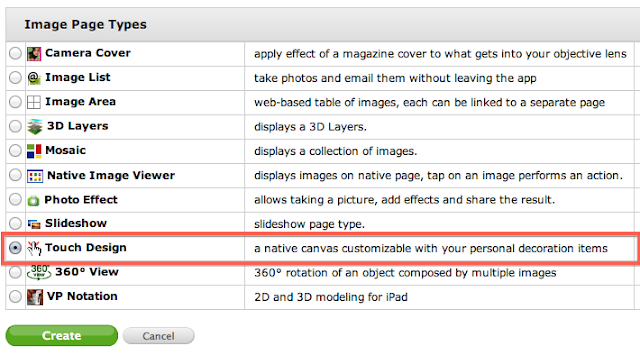 From the list of the page types available select the Touch Design one and click the "Create" button. Once the page is added, you are able to proceed with editing it. **NOTE: The page displayed in iPhone simulator on the left is for illustration purposes ONLY. It is just an image and there are NO clickable areas. Please preview this page using SeattleClouds app for iPhone/iPod Touch or SeattleClouds app for iPad. **NOTE: If you need a drawing board without any markers and with white background skip Step 2. Preview this page on a real device (I used an iPad 3). I tried to create a basketball attack tactic. THIS PAGE TYPE IS NOT YET AVAILABLE ON SC ANDROID. I've tried working with this page but the soccer pitch remains even though I have uploaded a background image. The resources are not seen either. Do I need an ipad to preview these elements? This page type is working as expected for me, please feel free to open a support ticket if you have an issue related to this page. This feature is perfect for my app. I can see that it works well when tested on an iphone. Will it be available on Android too? Chris, I don't have any info related on your request. I have some great ideas for a page like this and many others but I am still hampered due to the lack of ability to "Post to Twitter". This is crucial with today's social networking. I been asking for this functions for a couple of years now and I really wish Seattle Clouds would drop everything and get this implemented as a standard feature. Fortunately, Android offers this feature to post to all social networks from the phone or so it appears. I'm not sure if it's the phone or the google apps but I need this for Apple as well. Thank you for your feedback. 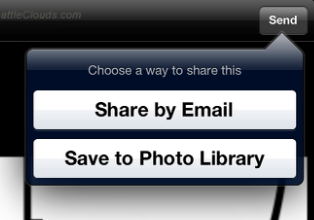 I think that very soon we'll integrate Twitter as sharing option. My app utilises the 'touch design' page type for the iphone. Unfortunately it's not available on the android meaning that my product isn't consistent over both platforms. This is resulting in some confusion and negative feedback amongst my android customers. I made this enquiry some time ago (see above) but recieved a limited response. Can I ask again, have plans developed to make this feature available to android? If not, may I ask if there is a particular reason why not and how difficult this might be to achieve. Sorry Chris, still no ETA. Is there a way to add the property of "resizable images" and "custom color palette" maybe including textures? Any update on Android availability for this page type? Need to find out if the word Background can be edited or change to something like Camera? Its the one when you choose, it will let you take picture from camera or choose from library. Sure, from the Localization Settings of your app. Any updates on Android availability?